Six nationalists were shot dead at point blank range by the unionist paramilitary UVF in the County Down village in 1994. The men died when two gunmen opened fire with automatic weapons in the packed bar as the Ireland soccer team played an opening game in the World Cup. The eldest was 87-year-old Barney Green. 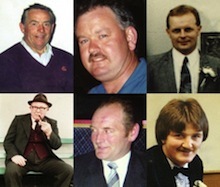 Despite at least one member of the murder gang being in the pay of the RUC’s Special Branch, and an admission that the RUC destroyed a car containing forensic evidence which could have led to prosecutions, the Ombudsman failed to blame the RUC for anything other than “failings” in their so-called investigation. Other “failings” included a refusal to gather DNA from key suspects, and ignoring the provenance of the rifle used to spray the bar with more than 200 rounds of ammunition. The rifle had previously been purchased in South Africa by British army agent Brian Nelson. SDLP leader Margaret Ritchie called on the Ombudsman to resign and said he has “repeatedly failed to measure up”. She said Mr Hutchinson had “done a great disservice to the families of those murdered”. Sinn Fein assembly member Caitriona Ruane said collusion “is the only conclusion which can be reached” and Mr Hutchinson “needs to explain” why he did not find any”. The families of those murdered accused Hutchinson of performing “factual gymnastics” to avoid finding collusion in the case. They were joined by survivors of the 1994 at a press conference in a Belfast hotel on Friday to respond to the findings of the probe, which they say “redefined the definition of collusion”. Among those present yesterday to support the Loughinisland families were campaigner Raymond McCord, whose son was murdered by the UVF, and Paul McIlwaine whose son David was stabbed to death by loyalists in 2000. Niall Murphy of Kevin Winters solicitors, who represents the families, said the omission of any reference to the RUC Special Branch in Mr Hutchinson’s report was “a case of ‘hear no evil, see no evil, report no evil’”. Barman Aidan O’Toole, who was injured but narrowly survived the atrocity, described the report as a “whitewash” and an “insult”. “The only thing is we are united and determined to keep going until we get the truth,” he said. “Police told us more than 10 years ago that they had found a hair follicle on one of the killer’s balaclavas they recovered. “We were told they would catch the killers if there was even one bead of sweat on the clothes they recovered. “Well there have been huge forensic developments in the past 17 years and yet the PSNI can’t even identify one of the killers. The Ombudsman’s office was also strongly criticised by a human rights group last week over a report that the office is staffed by former Direct Rule officials pursuing their own pro-British ‘securocrat’ agenda. In the report, Hutchinson dug in behind a narrower definition of collusion than previous inquiries, defining police collusion only as “an intentional, conscious or deliberate act.” This departed from a definition used by former ombudsman Baroness O’Loan, which included not just those acts committed by police,but also those they omitted. Judge Peter Cory, who also investigated collusion in the North, warned that security forces “must not act collusively by ignoring or turning a blind eye to the wrongful acts of their servants or agents”. In his carefully worded report, Mr Hutchinson said only that RUC Special Branch had “no direct involvement” in the Loughinisland case. Mr Hutchinson’s report also revealed the original senior investigating officer in the case refused to cooperate with the investigation. He said the retired officer’s decision was “unfortunate” and hampered his investigation but he had no power to compel the officer to cooperate. Asked whether some intelligence was not given to him, Mr Hutchinson said that he could “never give a 100 per cent guarantee”. Nationalists in the North fear that if the truth behind Britain’s ‘Dirty War’ is not uncovered, there is no guarantee that lives will mot continue to be lost at the hands of sectarianism and collusion by the police.